When we arrived here on New Year's Eve, our plan was to stay just a few days. We liked it so much we stayed two weeks! 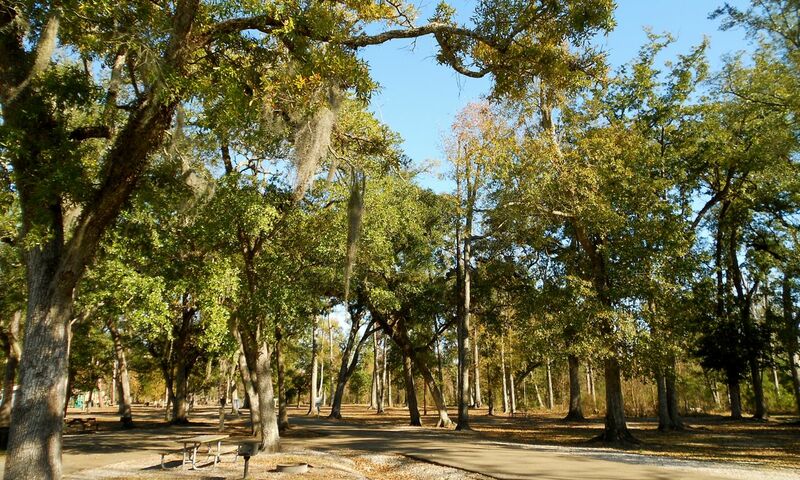 Fontainebleau State Park is a gorgeous 2800-acre park in Mandeville, LA. 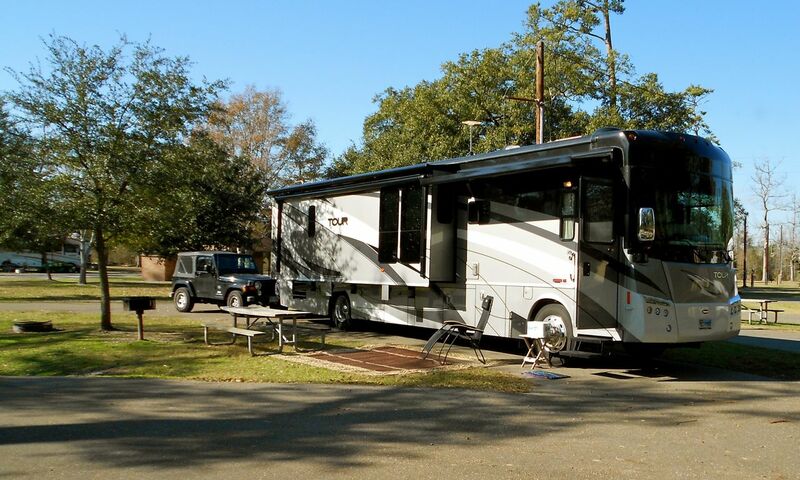 Nestled among magnificent live oaks, the park features two campgrounds, rental cabins, hiking and biking trails and a swimming beach. Our (almost) daily hikes always treated us with something special to see. 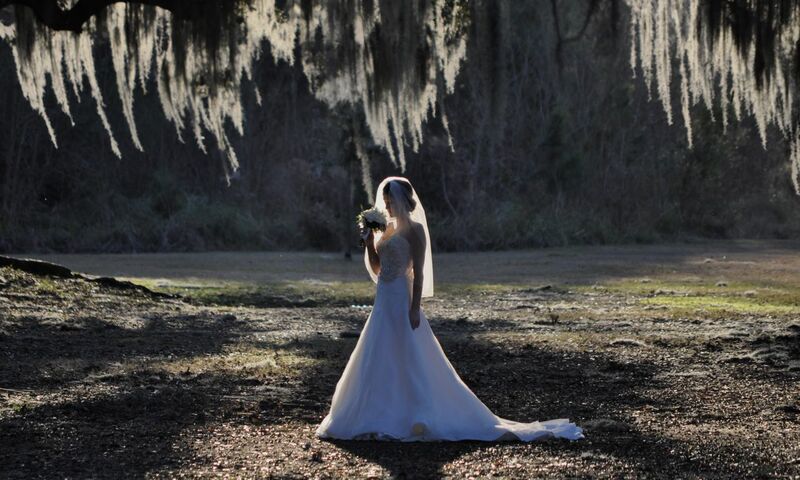 The Spanish moss in the late afternoon sun provided the perfect frame for this lovely bride-to-be. 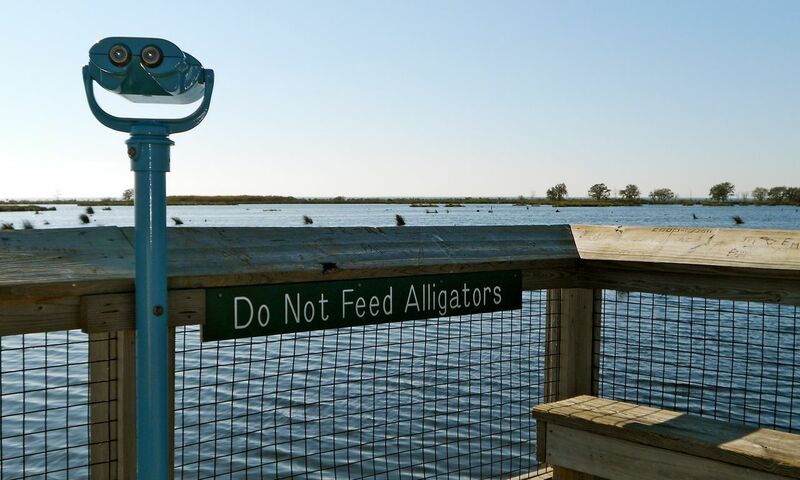 The nature trail along a boardwalk features wildlife viewing stations and a reminder not to feed the "locals". 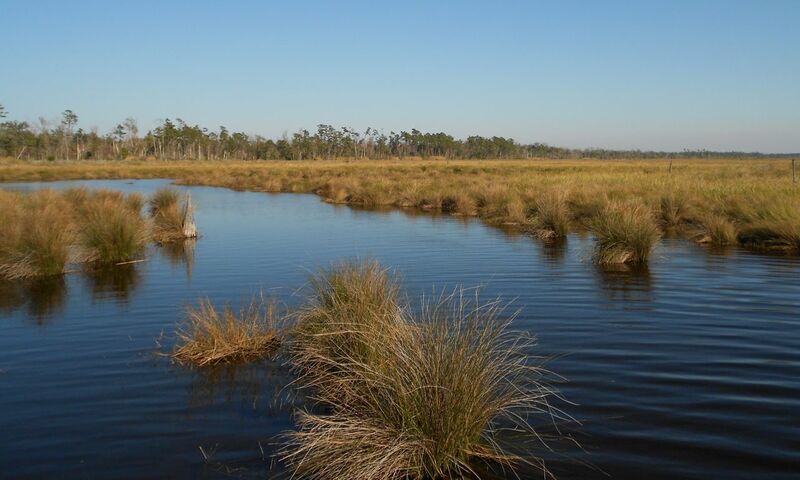 We didn't see any alligators, but the swamp was beautiful. 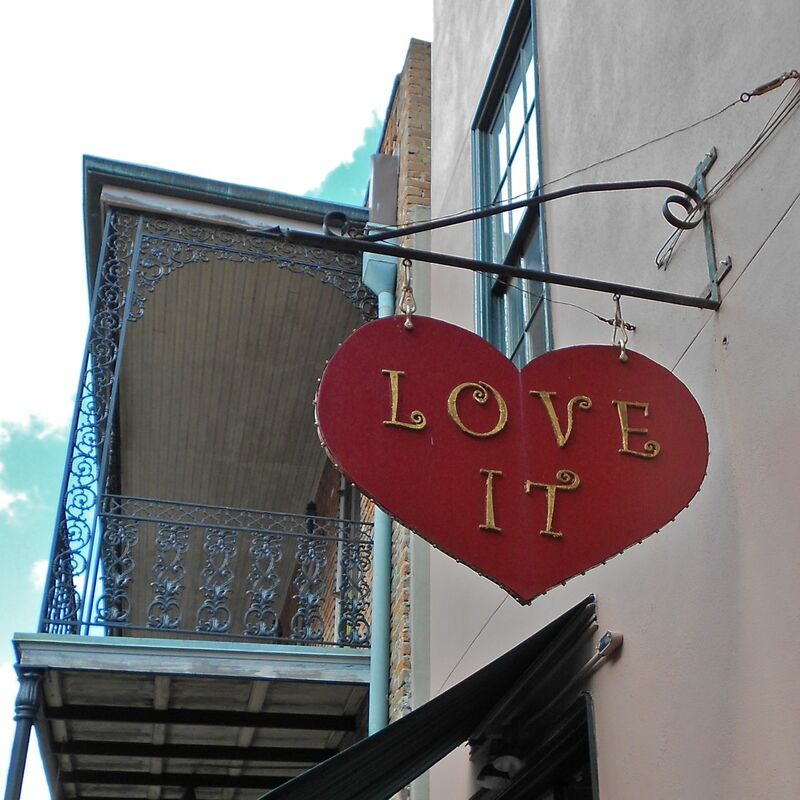 Our Louisiana food fest has continued here on the north shore. We discovered a Café du Monde here in Mandeville. 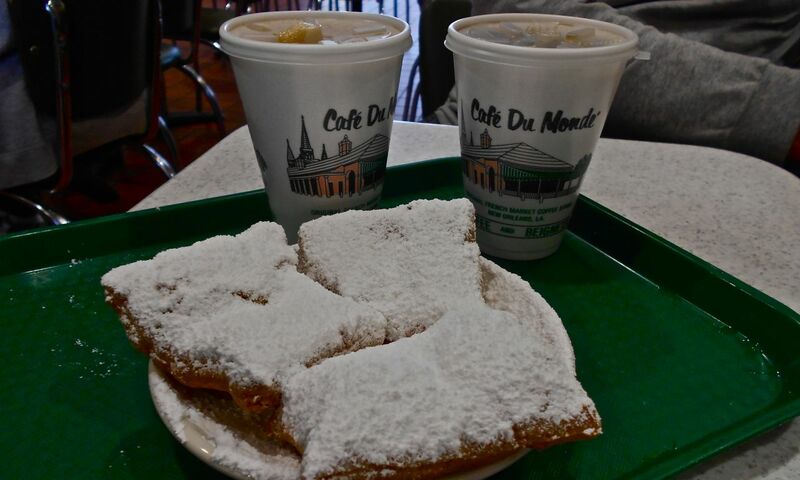 So, we just had to have a few more beignets! 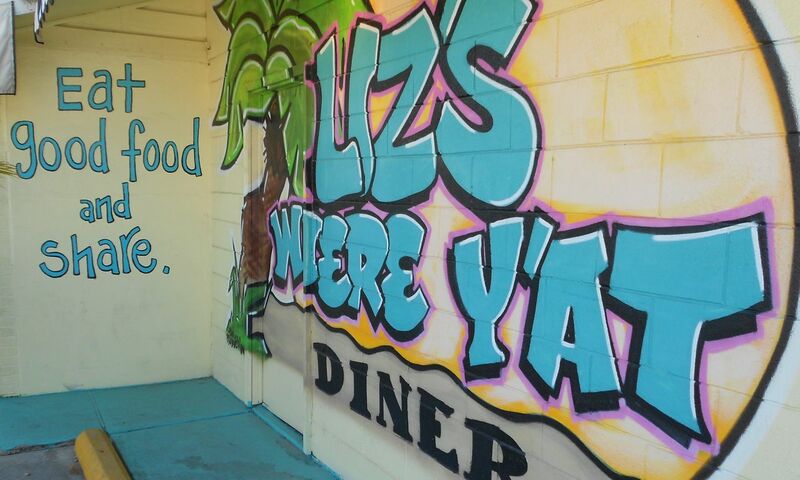 Our favorite eatery in Mandeville is Liz's Where Y'at Diner. What's not to like about a place with a name like that? When you call, they answer the phone, "Where Y'at?" 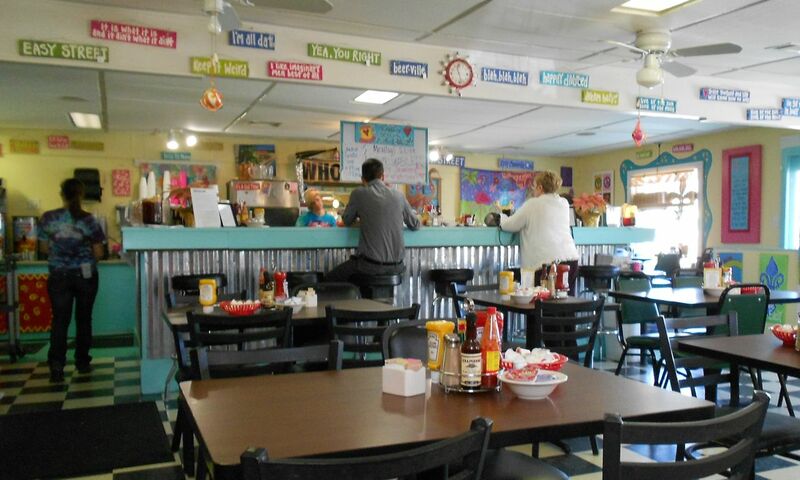 Inside, they served up a mighty tasty Eggs Sardou and the best cheesy grits we've had anywhere. With dishes like this, we may never leave the South! 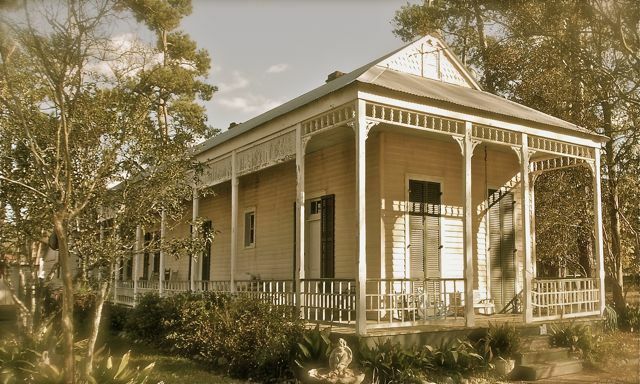 Our culinary tour of St. Tammany Parish took us to nearby Abita Springs, an old resort town. In the early 1900s, visitors came to this small town to experience the "healing waters" of the artesian spring for which it was named. Evidence of town's tourist heydays can be found in former hotels and boarding houses like this one. 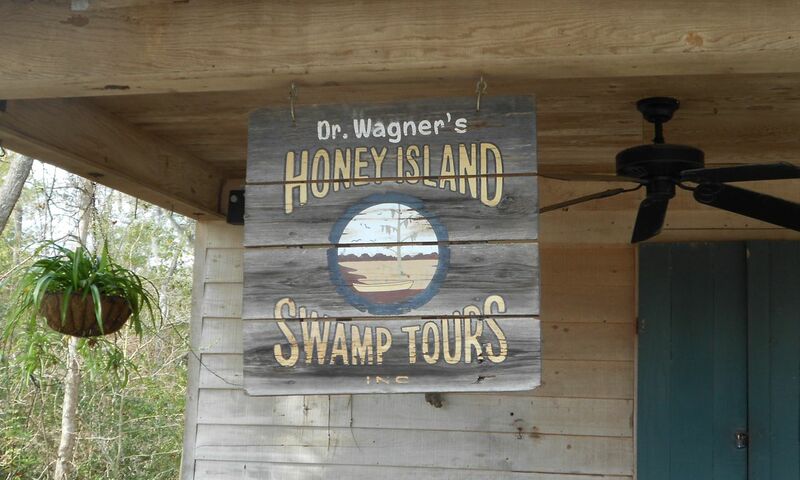 We didn't come to Abita Springs for the healing waters. We came for the beer! 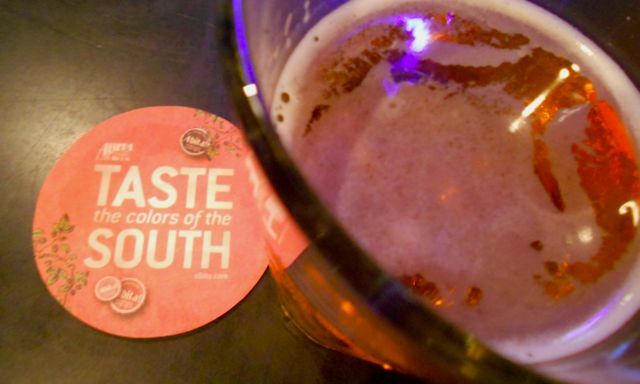 For 25 years, Abita Brewing Company has been turning the pure artesian waters into some colorful and tasty brews. The food at the brewery's restaurant was just "so-so", but the beer was mighty fine. We didn't just eat during our stay at Fontainebleau. We kept our hobbies fed, too. 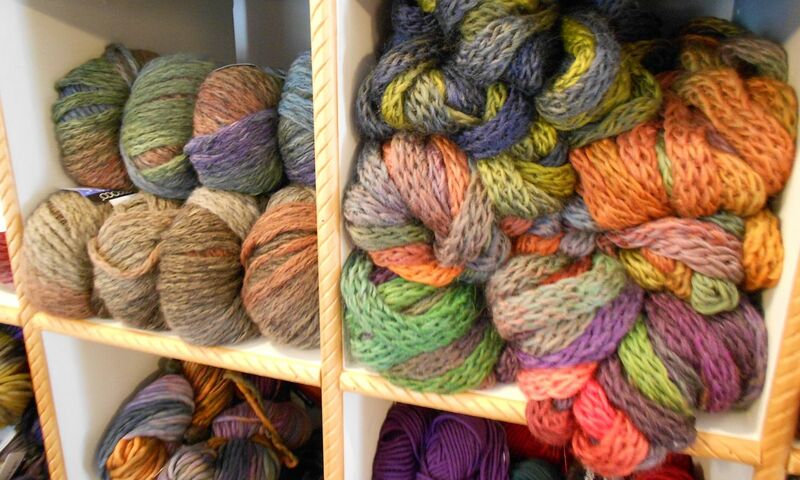 I found McNeedles, a delightful yarn store just down the road in Lacombe. 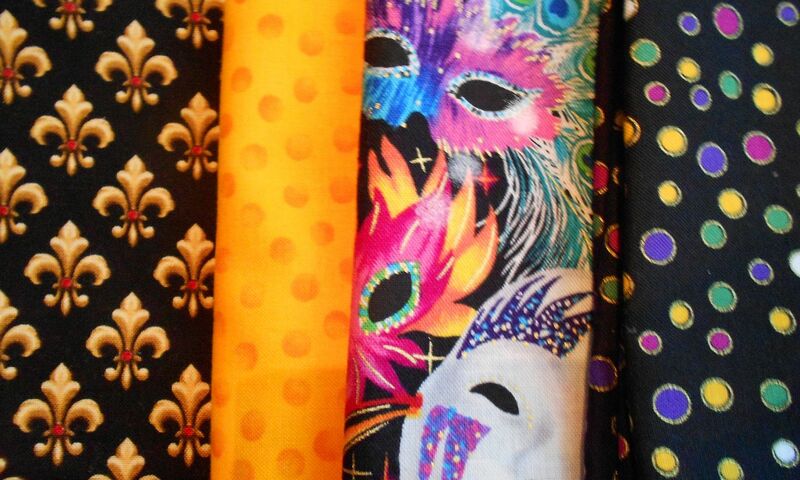 Some of my fabric choices from various states are a challenge to distinguish. But, these four are obviously all Louisiana. 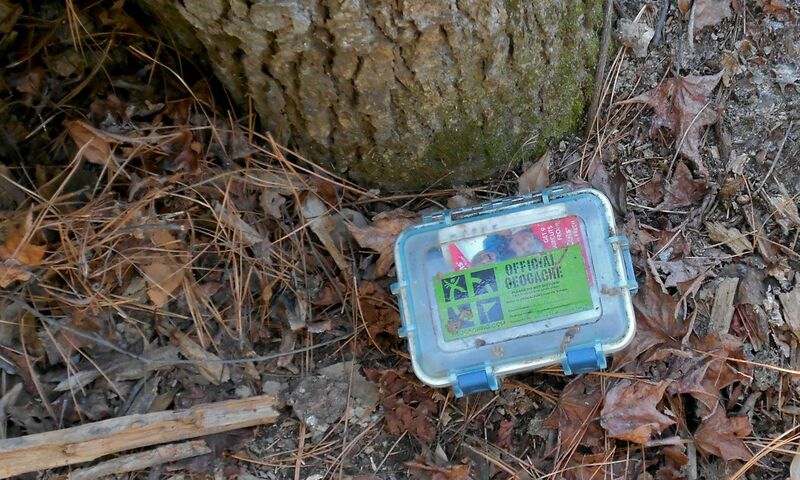 Fontainebleau's hiking trails provided a great opportunity to boost our geocaching numbers. A casual walk with Keith and Tricia turned into a fun six-mile hike and seven finds. We discovered more hiking trails, and a few more geocaches, at the nearby Northlake Nature Center. 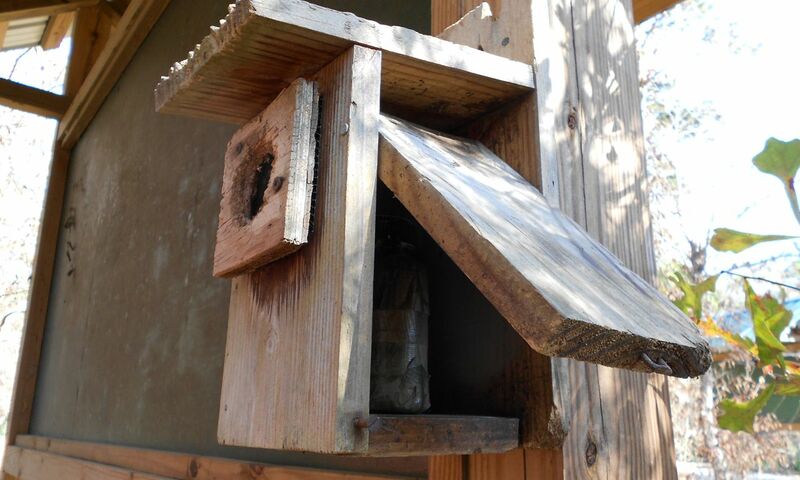 This particular cache was quite clever. 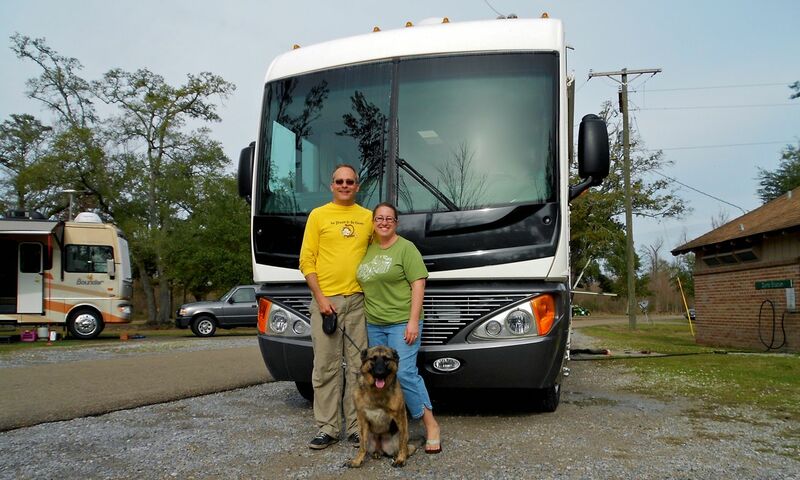 We had a great time meeting and getting to know Keith and Tricia and their pup Samantha. After their two weeks at Fontainebleau, they headed out for points west. We wish them good luck and safe travels. We're sure we'll catch up with them somewhere! Tomorrow, we'll head east to Alabama. 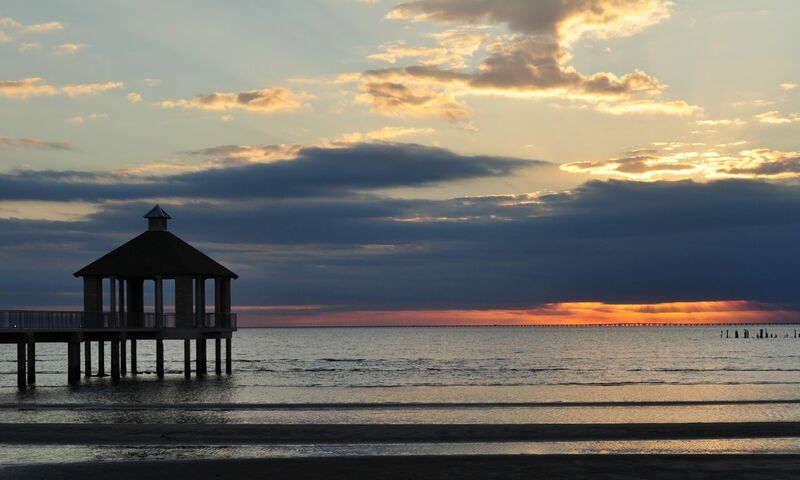 But, tonight we just had to enjoy one last walk along the lakeshore and enjoy another stunning sunset. 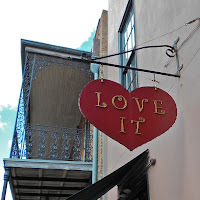 After three weeks in southern Louisiana, this sign from The French Quarter sums it up best. We have so enjoyed our time here. 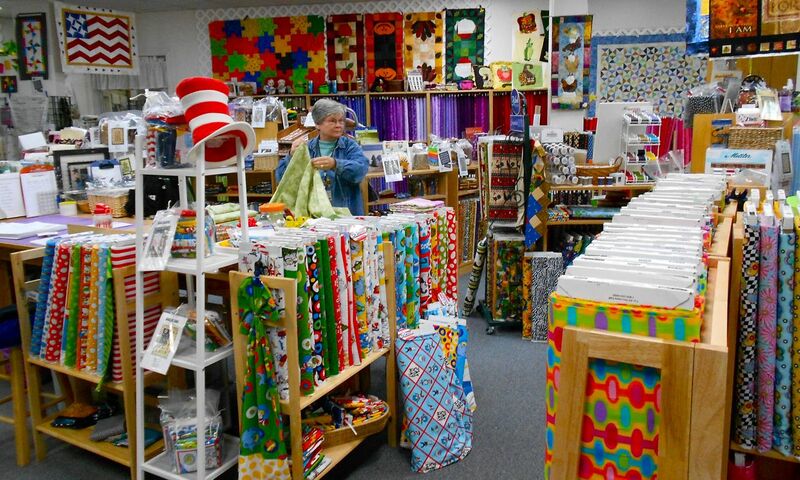 We're already looking forward to our next visit. Here's hoping we find just as much fun, but far fewer calories, in Alabama. 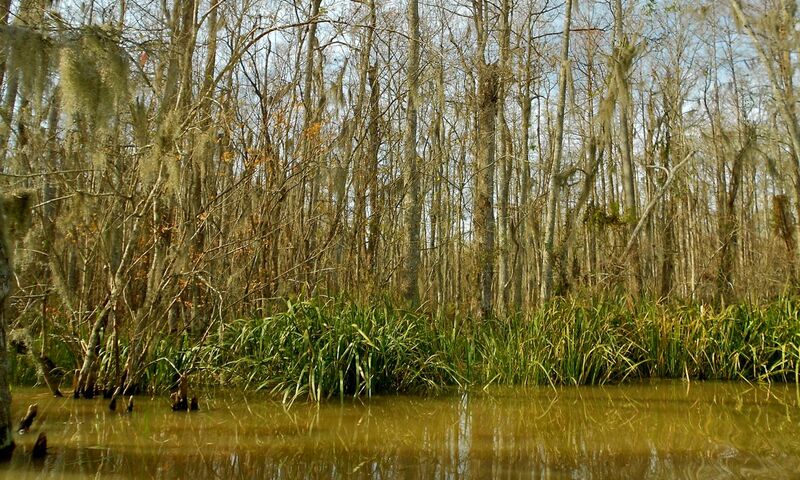 We ventured east to Slidell, Louisiana for today's adventure: a swamp tour! Fellow travelers and new friends Tricia and Keith hatched the plan for this outing. 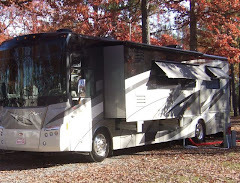 When they invited us to come along for the 90-minute tour, of course we said, "Yes!" Tricia and Keith selected this tour for its "geeky" reputation. 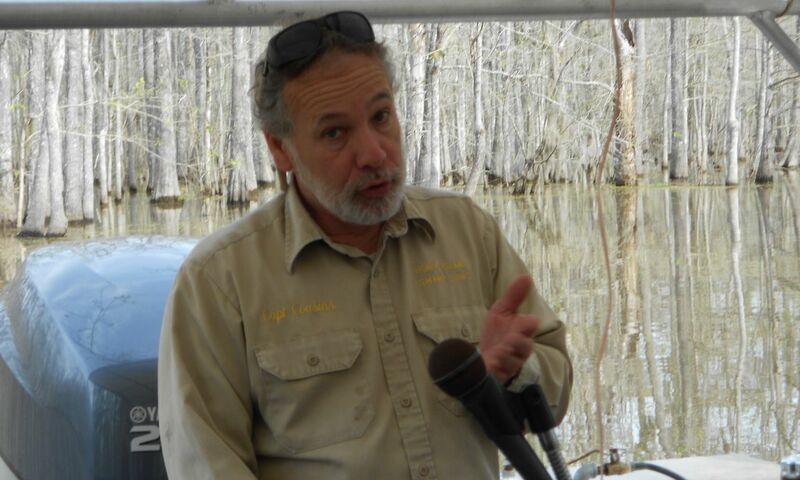 With Captain Cousins as our very knowledgeable guide, we set off along the Pearl River and into the swamp. Without a doubt, this guy knew his stuff. We learned lots! 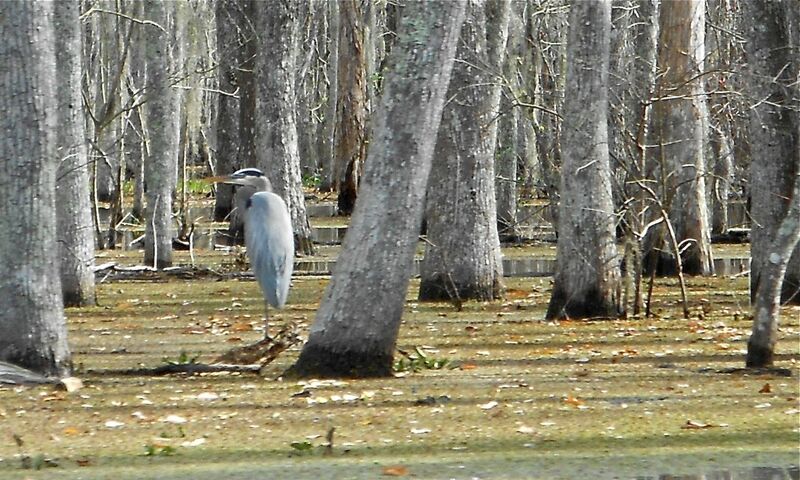 In winter, you can see further into the swamp. Try this in the middle of summer, and you can't see a thing. We floated by several structures perched along the river. 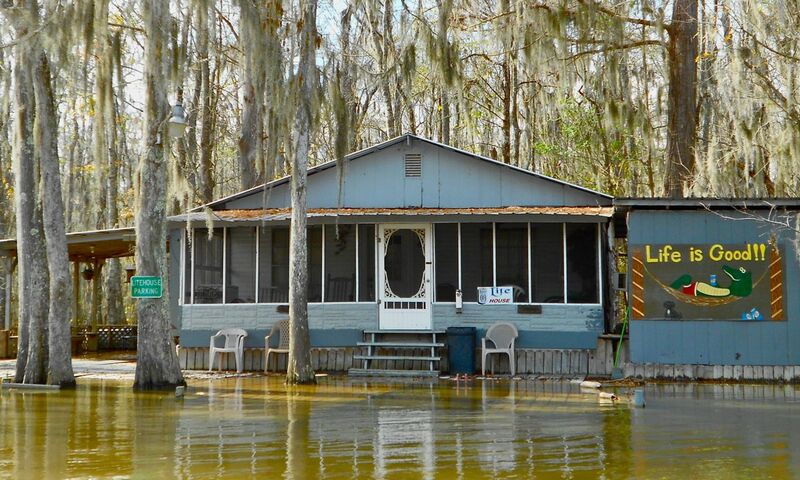 There was everything from high dollar homes to abandoned fishing camps destroyed by Hurricane Katrina. This cabin looks like someone's favorite getaway. Even along this rain-swollen river, it reminds us that life is good. Indeed, it is! 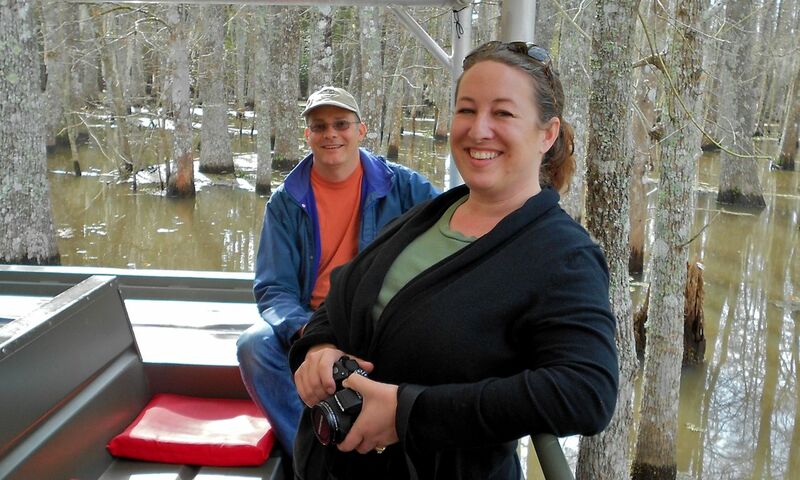 Thanks Tricia and Keith (and Captain Cousins) for a great day in the swamp. 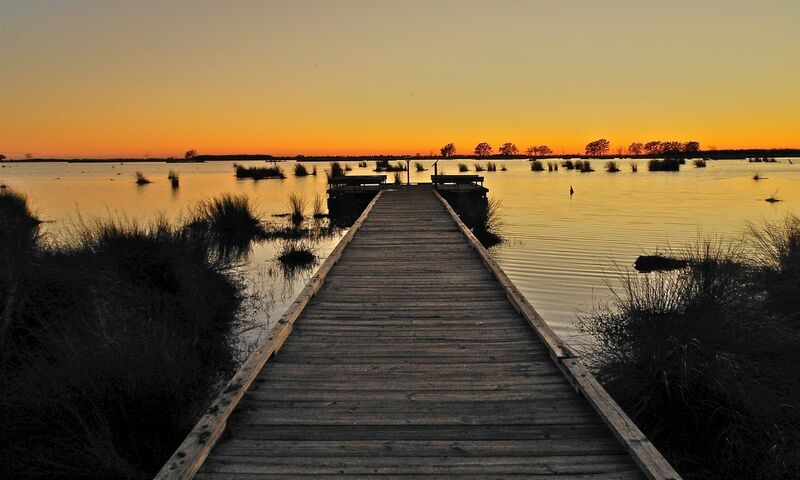 We look forward to coming back when everything is blooming and the alligators are on the prowl.